“Big Red” is an autobiography that begins with Griffey’s days just out of high school. The account relates Griffey’s decision to venture into the baseball business, documenting his time as a scout, coach, and manager along with his accomplishments as a father, raising two other major league ballplayers: Craig, who played briefly for the Seattle Mariners, and future Hall of Famer Ken Griffey Jr. The book chronicles his time with the Big Red Machine, detailing his days when he played alongside Johnny Bench, Joe Morgan and Pete Rose, highlighting the Reds’ two consecutive world championships in 1975 and 1976. Filled with amusing anecdotes and behind-the-scenes glimpses of what it’s like when baseball really does run in the family, this is a sports memoir unlike any other. Ken Griffey, Sr. is a former outfielder who played for the Cincinnati Reds, New York Yankees, Atlanta Braves & Seattle Mariners. He is the father of former outfielder Ken Griffey, Jr. He was inducted into the Cincinnati Reds Hall of Fame in 2004. 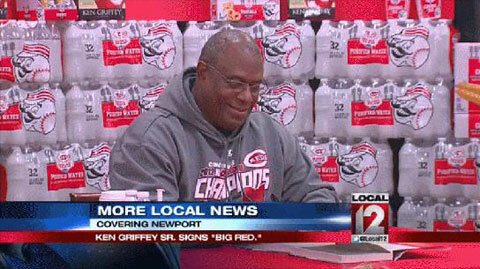 If you would like to book sports stars or MLB legends like Ken Griffey Sr for a speaking engagement, autograph signing, guest appearance, meet & greet, product endorsement, charity fundraiser or special event, please contact Ken Griffey Sr’s booking agent for appearance fees or call 1.800.966.1380.